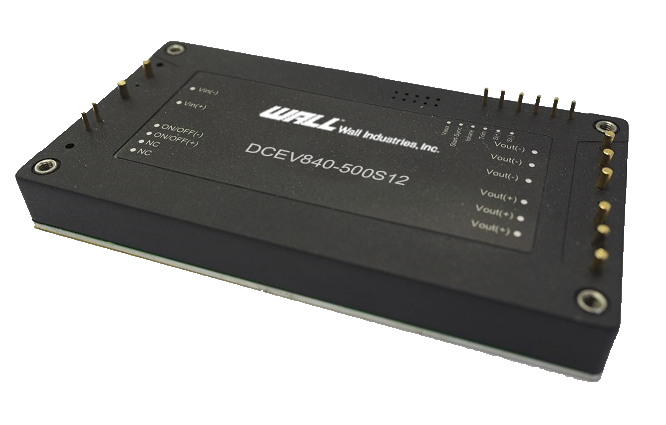 Wall Industries has recently introduced the DCEV1000 series of industry standard full brick DC/DC converters. This series has a high-voltage input range of 380-650VDC, up to 1000 watts of output power, and single output models ranging from 12VDC to 48VDC. Each model features active current share, high efficiency, high reliability, as well as high power density. Additionally, DCEV1000 is RoHS5 compliant, meets UL/IEC/EN60950/GB49943 standards, and has short circuit, over current, over voltage, and over temperature protection. See full series details on the series page. See more high-voltage input products here.